Free to Play Battlefield 2, start your free game now (2016). Description: Battlefield 2 Enemies are numbered and everybody tray to kill you. You are in the enemy site and heave 100 lives and chances to kill enemies soldier without afraid getting killed. 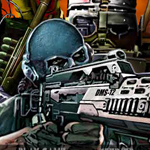 Loaded with 30 bullets per level, shoot your enemies and go to the next level where come more of them. To control you soldier move and shoot with your mouse.